On Monday, the lady houseful woke up and participated in her very first protest. It was exhilarating and it was for a cause that I’ve been talking about for a while on this blog. It’s serious here y’all. Let’s examine some facts. The mayor has taken about 18% of the library’s budget (which only takes 3% of the city’s budget) and cut it. He’s cut all pages from the library. Which means that now the librarians and clerks are responsible for reshelving books, which means that the librarians don’t have time to help patrons like the ladybug, or the cellist, or me, which also translates into them not having time for library programs. NO. STORYTIME. The mayor may be “getting things done” but he’s doing it at the expense of our children, homeless, and Chicagoans who actually depend on the library for things OTHER than just coming in and using Google. *insert eye roll* Because of my library, I’ve planned one of the best birthday parties for the ladybug – based on the library – and even had a special storytime there for her and her friends. I’ve learned to sew because all of these great sewing books are out their for me to check out. I’ve completed lesson plans for the homeschooling of the ladybug. I’ve taken books out to transport me to another world just for a couple of hours. The cellist has checked out books to help expand his understanding of a certain subject. He’s enjoyed reading books by Rick Riordan which led into books by lesser known authors because he asked his librarian for suggestions based on what he already liked. In other words, we use our library. We depend on the expertise of our librarians. And we need them doing their jobs. And the mayor is keeping them from doing that. 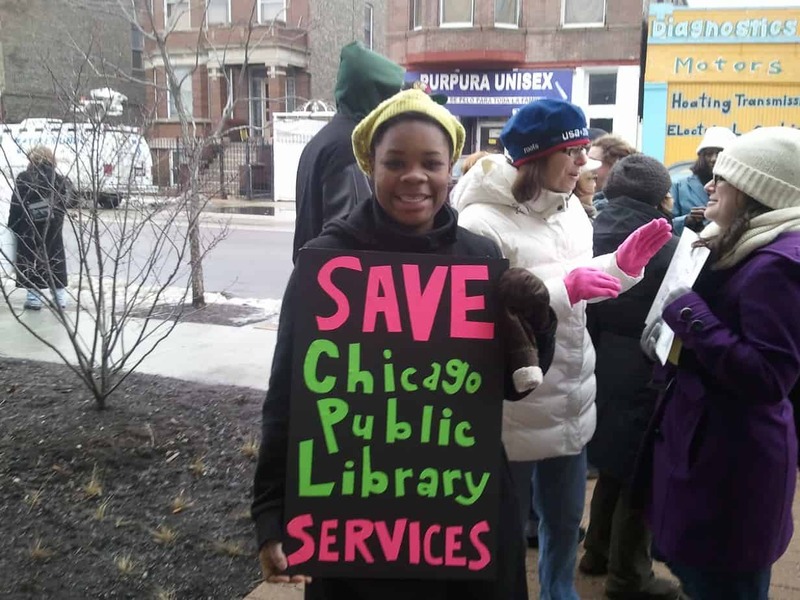 While I was probably one of the only patrons at the protest – I do feel that I did my part because MORE patrons should show that they are serious about not wanting the libraries to close. It shouldn’t just be something that you say and then keep going. I was told that several patrons came through to use the library that morning before I arrived, yet they didn’t stay. 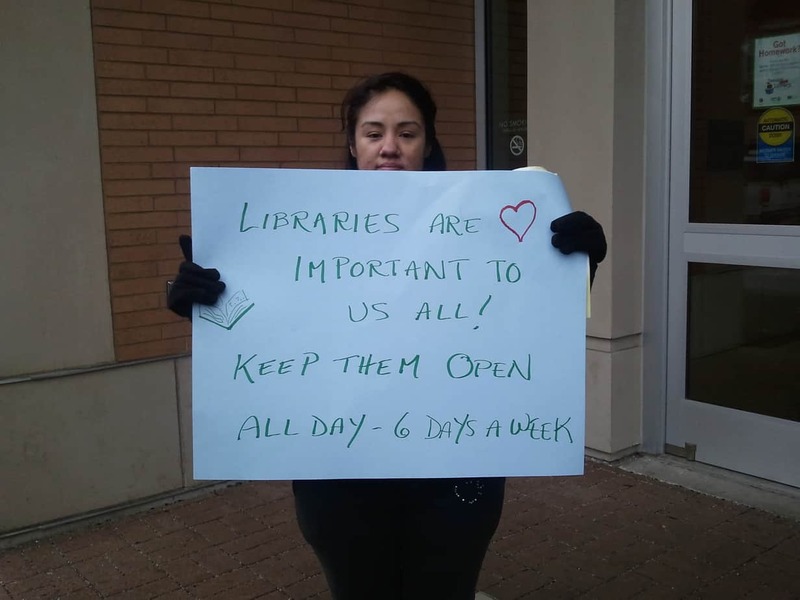 I’m not pointing fingers, but we HAVE to form a united front and show that the library is indeed important to us. When will we fight as a unit? I expect the librarians and clerks to be upset, these are their livelihoods that the mayor is messing with. However, those that get upset because they can’t serve in the proper manner hold a special place in my heart. Because the Houseful is hungry, for every item that is on the libraries extensive menu. ~Make It A Fantastic Day! As someone who is not a fan of the library, It has taken me awhile to grasp the concept of why this fight is near and dear to your heart. I prefer to own books, and would rather purchase what I need and want then borrow or wait to borrow something that I might not want to return. However, there are people who enjoying the loaning, borrowing process or require it’s use. Chicago’s fight is playing out in other cities across the US and will spread to many more cities in the months and years to come as our economy continues to founder. Government and the people are going to have to find realistic solutions to meet the needs of all, and I doubt that any one side will win. Americans want “it” now, and they want “it” nearby and are often as inflexible as the elected officials and the budgets that need balancing. The entire public service system needs a make-over to continue to serve the citizens, but renovations are ugly and come at a terrible cost, but in the end the results are often worth the trouble. Interesting view. I prefer to see it as me still owning the books, just thousands more than my simple little abode could house. I am one of those people who enjoy seeing new books come in, and trying them out. Let’s face it. The library is one of the only places where you can definitely try before you buy. If I do love a book that much, it let’s me know that it is worth my money, and I don’t feel duped if I purchase first and then don’t love it. It’s happened. The library is so much more than the loaning of books/CD’s/Videos. It’s a gathering place, a place to go and see the people from your neighborhood while you all catch up with each other. I have librarians who think of me when certain programs or book discussions come up. They actually call me at home to let me know that they think that I would be interested. If I mention a book in passing, and they come across it, they keep me in mind. It’s about the service, the freedom to read what you want, when you want. To be able to learn anything that you desire, for free. I’m sure that there are more pressing areas in the public service system that need cuts over the library, but our public library system continues to be on the bottom of the totem pole because people do not take it seriously. In the time of Google, and e-books, the necessity of having to actually go out to your brick and mortar library is decreasing. My love for the library started as a child. The smell of books, the ability to be transported to another world to take me temporarily from one where cynicism and so much cruelty exists. I love seeing that for my children. I love seeing that for other children, and other adults who come in realizing that they can travel anywhere with just a library card. In a society that focuses on the importance of education, yet takes away the funds of one of the biggest proponents of education makes no sense to me. And if another protest presents itself, I will gladly participate in that one too. If you had to make a compromise, about the current library system, what would you keep, what would you do away with for the sake of having a community gathering place? I know that when the talks of budget cuts came about, I did wonder why they were rebuilding brand new libraries in communities that already had established library systems. And by established, I mean, not run down, and filthy. Maybe even evening out the amounts of pages in each area. Getting rid of them ALL just puts a lot of strain on the librarians and clerks who have other jobs to do. I understand that sometimes in balancing a budget that people will lose their jobs. I’ve been on that end. However, cutting entire days, and entire job lines is a bit ridiculous in my opinion. And I see this as a form of bullying. Only because as I’ve stated before, the library budget makes up 3% of the entire city of Chicago’s budget. Rahm cut 18% from it. That’s not particularly fair. These big name politicians could spare to lose some of their cost of living increases (as they’ve suggested the librarians do) and maybe we could make up that cost there. They want us to tighten our belts, they should lead by example. And just for the record, the library is much more than just a community gathering place. It’s a place of learning, teaching, expounding and freedom. It’s nice to see children learn how to create podcasts, and learn coding that may not be offered in their school systems. It’s also nice to see children, and adults alike participate in pretend play during storytimes or special library events that may happen. Miss Lori – a big supporter of literacy in Chicago and the nation, visits the libraries to spread the word on literacy and the importance of it. With so many schools losing their libraries as well, the children NEED someplace to go to in order to build imaginations, vocabulary and just a love of learning in general. Every parent isn’t as passionate about education as we are, and sometimes it’s left up to the children to grasp. Merriam-Webster’s dictionary defines ignorance as lacking knowledge or comprehension of the thing specified.” It was important that I post this because there’s nothing that I abhor more than the baseless argument. Did I miss the memo that declared public libraries an “…unrealistic solution?” You’ll have to forgive my inner-socialist for believing that public libraries, or as my circle called them, institutes of FREE higher learning, are the back bone of many communities. News flash…not everyone can afford a computer. Not everyone has access to Google. Libraries represent more than book rentals. My children love our public library. They feel a sense of accomplishment and importance with each opportunity that they are provided to present their library cards. They take pride in the trust that the library has in their ability to return borrowed material. I’ve volunteered to teach English at the public library. I’ve educated people on the home buying process at the public library. My baby girl listens to people read stories at the public library. I donate books to my public library. I tutor at my library. I love my library, and so does my family. Google will never be a substitute for human interaction. Really proud of you Natasha for doing the protest! It takes a lot to get out there and stand up for what you think is important. But as someone who’s been on a board and dealt with budget cuts, I also feel the pain of politicians who have to make those difficult decisions. We all have our issues that we lobby for and those may change as we hit different stages of life. Yep, tough decisions are necessary, I just feel like he’s targeting one of the last public institutions that we have, and he’s targeting hard. As a librarian, I’m disheartened to see ANYONE still believe that libraries are ONLY for the loaning and borrowing of books. We are information professionals, and information is something that isn’t going away, so why should it be that those of us who live to share, teach and explain information should go without jobs? Learning is a lifelong experience, and to that measure we should be doing more to cultivate and protect the institutions of it, especially if we seek to “make over the system”. Without educated and informed people, how could such reform take place? In my job as a youth librarian, I do far more than connect kids to books, though it is something I hold very high on my list of great benefits to my job. I provide a forum for public and social engagement. I expose my teens to new technologies, emerging skill-sets, and provide much needed opportunities for seeing things beyond their own backyard. Now, before someone assumes that schools or parents should do those things, I have to say that I agree. BUT, as a librarian I also engage with homeschooling parents such as you Natasha who seek new ways to teach and learn with their children. I help provide access to information by carefully curating and personally educating patrons on how to navigate this new and sometimes overwhelming information world. I assist teachers with their lesson plans, exposing them to materials and resources they may not have even known about. I’ve helped children find resources that taught them to draw, introduced them to a country they were just curious about, and reinforced literacy skills for both children and adults. While yes these things could have been achieved by purchasing a book for their own use, or even in a different setting, I am proud to be a part of a profession that puts a face and a listening ear to information, knowledge and the pursuit of both. I enjoy the fact that I work in a place where someone can come and literally change their life by experiencing something they may not have received anywhere else. My teachers taught me how to read, and the skills I needed to know…but my librarians taught me how to find the things that I wanted to learn, and how to synthesize them. At the end of the day when I can share a book with someone, I do that too, but I am far more than a book loaner. All that being said, I would hope that anyone unsure of what value a library truly can be for a community, would take the time to visit one and see what all the fuss is about. If you try one that you find to be less than satisfactory, TELL SOMEONE. Many times, even beyond the idea that purchasing books is better, people have a bad experience with a library employee and prefer to toss the baby out with the bathwater. Quite often, there are librarians who are overworked, underpaid, and yet still eager to share, learn and talk with you…if you let them. The cuts proposed by Chicago are minor in comparison to the full closures that other cities have done, but they are highly significant. Children with access to the programs and materials of libraries produce higher standardized test scores, and for many it is their first and most intimate introduction to public service via library clubs and programming. I applaud you Natasha for standing up with my colleagues. It means the world…quite literally. Regina, while I understand what you are saying, I don’t believe that Librarians hold the key to knowledge and are my gateway to a world of books. Maybe 20 years ago, but not today in an age when anyone can perform a Google search and have thousands available book choices. If librarians ceased to exist today, people who have a desire for books and knowledge would find alternate avenues to satisfy their mind. Yes, you provide a human connection, but human connections don’t translate into dollars and cents. I don’t underestimate the role of the librarian, but there has to be a more cost effective model that will allow citizens who rely upon your services a way to personally connect with you and other librarians as needed. There are many way to enhance the public library system, while maintaining the presence and integrity of the librarian without spending an excess of funds on draconian buildings. The library needs a face lift, it needs to change to fit into the 21st century and beyond. Nothing is static, least of all education. Without forward thinking, and plans to provide more with less, people who depend upon the library system will lose it all, because some don’t want to think beyond yesterday. Librarians don’t hold the key to knowledge, but we do provide an accurate and flexible medium to its access. On the issue that libraries need a facelift to fit the new age, I agree with you, and so does the American Library Association and most Library Science degree programs around the country. We are already working to adapt, change and provide more than just surface value services. People who choose to ignore what we do in favor of only “the new” cut us off at the knees before even stopping in to SEE the ways we have already adapted, changed, and progressed. Libraries are cultural, educational and social centers, which revolve around a society using them as such. It does make me sad that the library seems so off-putting to you, but I must also say that it could very well be that you are one of the lucky ones for which other opportunities in your life have made alternative forms of information seeking readily available. For many of us, especially those who have grown up in Chicago’s neighborhoods and school systems, these things were far more elusive. It was in having a place to go to read, to interact, and to discover things I hadn’t even known I’d wanted to know, that I found peace. And that is what I believe Natasha is fighting for by fighting for her library. We provide the resources that some people have no other way to access. Information and media in all forms that some people cant even foresee themselves being able to attain. From video games, music, tax and government documents, as well as job seeking assistance, computers, cameras, even musical equipment. We matter. Maybe not to everyone, but to a LOT of people. I’m a librarian and I use Google as well as Wikipedia, so it isn’t that I discourage the use of these resources, I just know how and when to use them. Google can find just about anything, sure. But can it explain what it finds? How about if you aren’t asking the right questions to get to the information you really want? Is Google going to suggest a dissertation, manuscript or other less-known resource when you research something. What Google will do, is produce over 3,000 results that many people aren’t going to even attempt to sift through. They will take the top 5, which are based on algorithms rather than actual usefulness, and run with them. Algorithms function fine, but a well-trained information professional functions efficiently. For many of us, we already ARE providing more with less, and that’s why I appreciate patrons and users such as Natasha speaking out about the time coming for those who haven’t made the same sacrifice, to reduce their OWN spending. Seriously, stop by your local library sometime. They may change your mind. And if they don’t, speak up about them changing themselves! We are service professionals and should be doing everything in our power to please and serve the communities within which we reside. So if yours isn’t doing that, tell them so. But please don’t just cast us off. PS. I don’t mean to come off confrontational. Re-reading it, I see how that may seem the case. I just take this fight personally, for obvious reasons of course. I do agree that at the end of the day, the debate boils down to..”Well where do you expect the money to come from”, but I have to again agree with Tasha that this was perhaps NOT the best place to get it. Especially considering the fact that CPL has been understaffed and overworked for years already without this additional slap in the face. Wonderful, wonderful post. The libraries are also very important to those individuals who do not have access to the internet and computers at home. I find it very interesting that many of the anti-library responses come from the viewpoint of “I’d rather buy books than borrow” or “You can find everything on Google.” Both of these responses come from the viewpoint of a privileged class that has excess money to buy and store books and to have a computer with internet access. Natasha, as a librarian I would like to thank you for taking the time to stand up for your library. I also want to thank you and others like you who understand the value of libraries to their communities. I won’t rehash everything that you, Regina and Leslie have already said (I really don’t think I can say it any better) but I will say to those who don’t understand how important libraries are to the communities they serve, check out the Library Day in the Life Project and find out what librarians do, learn about the varied services that are provided by libraries and then come back and say that you fail to see the value. How awesome! I love love LOOOOOVE my local library system and STAY reserving books (I have a 100+ book list seriously). I think library budgets get cut because sadly, fewer people will complain about those cuts. I am with you though in loving our libraries. I remember getting so excited each week when my parents took me – I would get a huge stack of books and devour them. As I got older I learned there was so much more I could utilize the library for as well and to me these uses have continued to grow and reach into modern life all of these years (I’m 41 now). My husband had never been to a public library – only the school library – growing up and he was amazed at all the cool things he can do at them. Once we had a child we spent even more time at the library – including all the years we homeschooled him. Not only were all of the librarians in the different departments instrumental in our homeschooling, but the entire staff was. Plus we utilized the library for meeting others with similar interests and to learn new things. We still use the library all the time. We visit different libraries as well. I think many library districts are doing an amazing job of coming into technology also. We can even borrow books for our eReaders now. I could go on and on about how important I think libraries are to ANY community. And MomOmnipotent just because YOU want to OWN your own books does not mean that everyone wants the same or even that everyone could afford to buy all the books they wanted.